Have you ever wondered about all the gadgets the technician and doctor use to examine your eyes? 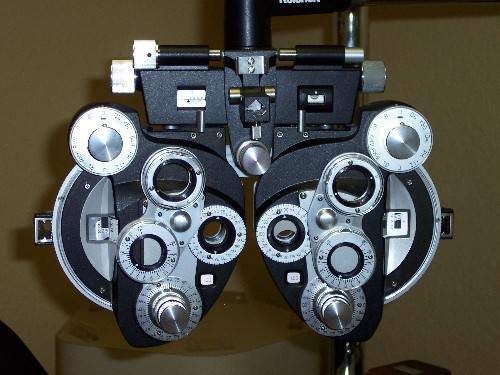 We use many tools in Optometry and Ophthalmology to perform eye exams. Chief among our tools is a device called the Phoropter (pictured below). You may not recognize the name, but you probably know what this tool is and what it's for. The Phoropter is like a giant pair of eyeglasses on a swinging pole. With this device, we are able to determine your glasses prescription as well as measure your best potential vision. This test is called the "refraction". The phoropter measures vision correction needs in 0.25 diopter increments for nearsightedness, farsightedness, presbyopia and astigmatism through the use of multiple lens wheels inside the device. Literally thousands of lens combinations can be created so that just the right correction can be found for you. The phoropter has been used to assist in prescribing glasses for over 100 years, although there are other ways to accomplish the same goal. The "old school" method employed loose lenses and a lens-holding frame worn by the patient. There are also newer technologies like the "autorefractor", a computer which estimates the eye's prescription by analyzing how light is bent when it is reflected off the back of the eye. In a similar way, a handheld tool called a "retinoscope" can also be used to estimate the prescription. Use of the autorefractor and retinoscope are objective methods for determining refractive error, whereas refraction with the phoropter is subjective and based on your responses. Don't worry - regardless of how bad your eyes are, your prescribed glasses won't be as big or as heavy as the phoropter!